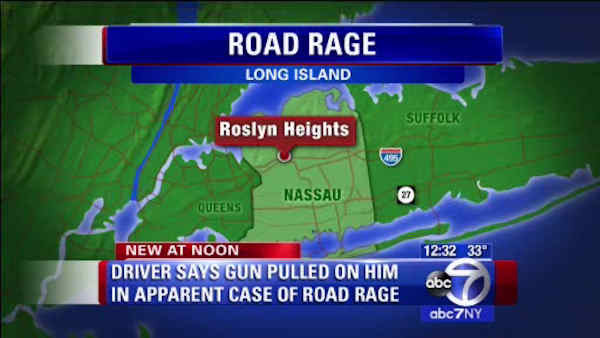 ROSLYN HEIGHTS, Long Island (WABC) -- Police are investigating a road rage incident on Long Island. According to the Nassau County Police Department, on Monday afternoon, a man was driving east on the Long Island Expressway in Roslyn Heights with his family. Another driver pulled in front of the victim and applied his brakes. As the victim pulled into the HOV lane to pass the other driver's vehicle, police said the man rolled down his window and pointed a black handgun at the victim, then fled. He is described as a white man, late 20s with red hair operating a 2008-9 black Honda Civic 4-door sedan with tinted windows, and a Jets sticker in rear window with yellow New York registration plates. Anyone with information on the case is asked to call Crime Stoppers at 1-800-244-TIPS.